These special four concerts presented by Murder In The Front Row and Loudwire will feature the core four members – David Ellefson, Mark Menghi, Mike Portnoy, and Alex Skolnick – sharing the stage with Chuck Billy (TESTAMENT), John Bush (ARMORED SAINT), and Phil Demmel (MACHINE HEAD) and returning to the MA live show ranks after a three year hiatus, Grammy Award winning vocalist/bassist Troy Sanders (MASTODON). Each night will offer a unique experience as with any METAL ALLEGIANCE show, you never know who will drop by to join the festivities. For the April 17th show in Phoenix, the band will be joined by Max Cavalera (SOULFLY) whereas the April 20th show in San Francisco will include Steve “Zetro” Souza (EXODUS) and Gary Holt (SLAYER/EXODUS).Opening the four nights are SUPERFIX and WEAPONS OF ANEW. 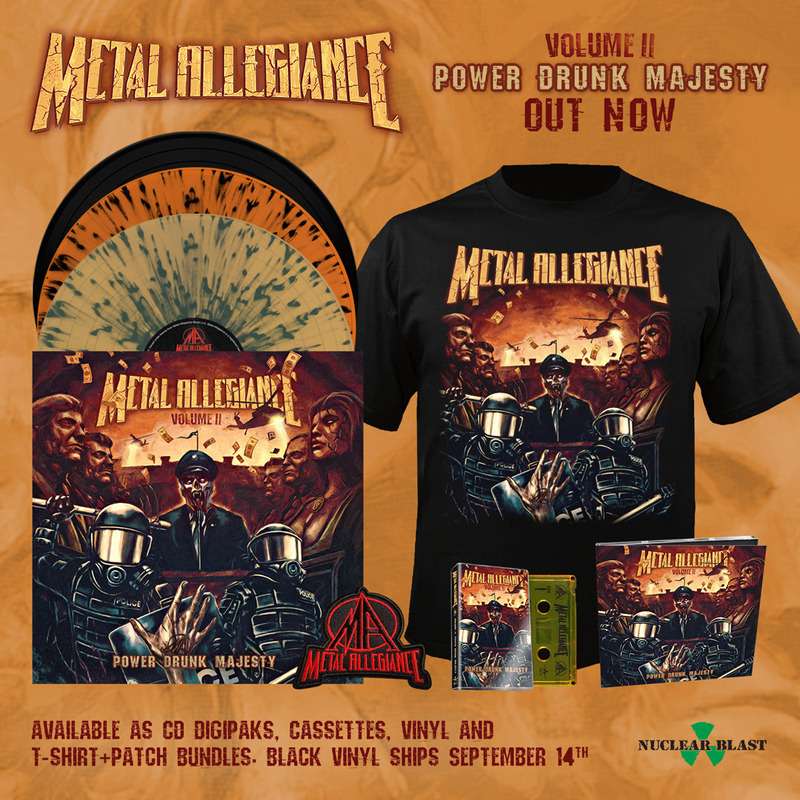 Volume II – Power Drunk Majesty was produced by Mark Menghi and Alex Skolnick while Mark Lewisof MRL Studios handled the mixing and mastering. The cover artwork was created by renowned artistMarcelo Vasco (SLAYER, MACHINE HEAD, SOULFLY, HATEBREED) and Rafael Tavares.